On May 1, 1961, Castro declared Cuba as socialist state and officially abolished multiparty elections. Critics noted that Castro feared elections would eject him from power. In June 1960, Eisenhower reduced Cuba's sugar import quota by 7,000,000 tons, and in response, Cuba nationalized some $850 million worth of U.S. property and businesses. Health care and education were socialized. Both dramatically improved. The new government took control of the country by nationalizing industry, redistributing property, collectivizing agriculture and creating policies that would benefit the poor. While popular among the poor, these policies alienated many former supporters of the revolution among the Cuban middle and upper-classes. Over one million Cubans later migrated to the U.S., forming a vocal anti-Castro community in Miami, Florida, actively supported and funded by successive U.S. administrations. Within months of taking control, Castro moved to consolidate power by marginalizing other resistance figures and imprisoning or executing opponents. As the revolution became more radical, hundreds of thousands of Cubans fled the island. Castro declared Cuba a socialist state on April 16, 1961. For the next 30 years, Castro pursued close relations with the Soviet Union until the demise of the U.S.S.R. in 1991. Relations between the U.S. and Cuba deteriorated rapidly as the Cuban regime expropriated U.S. properties and moved towards adoption of a one-party Communist system. In response, the United States imposed an embargo on Cuba in October 1960, and broke diplomatic relations on January 3, 1961. Tensions between the two governments peaked during the Bay of Pigs Invasion of April 1961 and the October 1962 missile crisis. Following Batista’s ouster, Castro maneuvered past those calling for an elective democracy to gain control over the Cuban state. He began to expropriate property, nationalize industry, and build political and military ties with the Soviet Union. 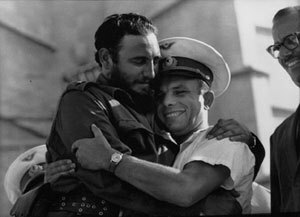 In 1960, Castro officially declared Cuba a socialist state, purged media opposition and imprisoned political dissenters.